Situated in the business district, this hotel is within 1 mi (2 km) of Sri Srinivasagar Kaliamman Temple and Kuching Waterfront. Vivacity Megamall is 2.4 mi (3.9 km) away. Along with a restaurant, this smoke-free hotel has a fitness center and meeting rooms. Free WiFi in public areas and free self parking are also provided. Additionally, dry cleaning, a 24-hour front desk, and free newspapers are onsite. All 68 rooms provide free WiFi, coffee makers, and LED TVs. Other amenities available to guests include free bottled water, hair dryers, and showers. The hotel offers a restaurant. Guests can enjoy a complimentary breakfast. Public areas are equipped with complimentary wireless Internet access. This Kuching hotel also offers a fitness center, complimentary newspapers in the lobby, and dry cleaning/laundry services. Onsite self parking is complimentary. 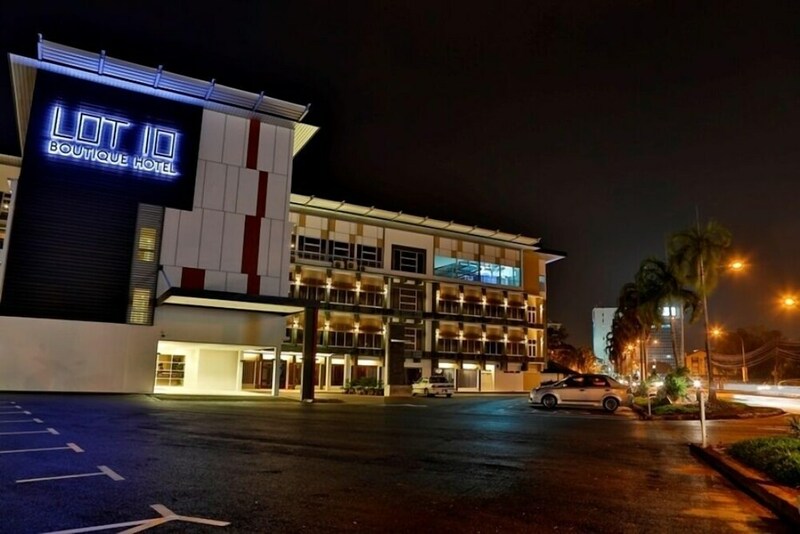 Lot 10 Boutique Hotel Kuching is a smoke-free property. The Pipe - Onsite restaurant. Guests can enjoy drinks at the bar. Open daily. Rollaway/extra beds are available for MYR 40 per night.